In orthodontics we move teeth with basic mechanics. When you push on something (a tooth), you have to pull on something else. You "brace" yourself against a stronger object. When you are moving teeth, the thing you brace against is called the anchor-you know, like an anchor on a boat. Most of the time, anchorage is achieved by placing one force against a small tooth that you are trying to move, against another large tooth (or several teeth tied together, the "anchor"). The small tooth moves a whole lot more than the anchor. 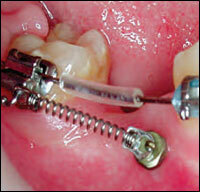 There are several instances in orthodontics where this anchorage is an elusive thing to acheive. TAD means Temporary Anchorage Device. These are basically very small screws inserted into bone. The TAD does not move, the tooth then can be moved against this fixed point. TADs are removed when they are no longer needed. Without the braces it almost looks like a piercing. You guys may be trendsetters! :) Great post! Does look kind of "rad" doesn't it. 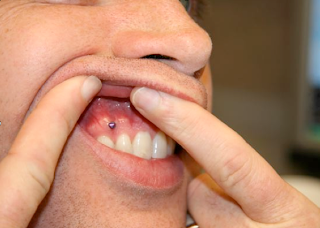 I'd rather see a TAD in place for good reason than a pierced tongue stud for no good reason. LOL, I can't imagine using RAD nowadays. But yeah, it does look cool. Hey that is so painful. But its better to get your teeth in level. Actually it is not painful at all. with a littel topical anesthetic placement of a TAD is easy. In our office this does not cost the patient anything additional. It's just part of the overall treatment. I do not know off hand how much it "costs" the dentist to get the devices and training, but I think no more than any other orthodontic device. I think, invisalign braces are good because it looks more natural unlike the ordinary braces. Unfortunately not all people are candidates for invisalign. Before availing this dental services, you have to ask your trusted dentist if invisalign fits your dental needs. In Chicago, dental implants and porcelain veneers (Chicago) are very popular dental services. Although those services are popular in making your teeth look more beautiful, I still asked my dentist if one of those services will fit my dental needs. I lost a tooth last year because of an accident. I want to replace my lost tooth and also I want to have whiter teeth. Maybe I can't avail those services at the same time but maybe one of them will fit my dental needs. 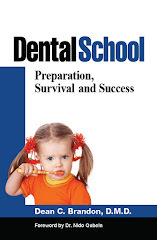 Can you provide any references to read about success rates for permanently closing an open bite with the use of TADs? B. Depends on etiology. Is it resolved? Large tongue, forward tongue posture/thrust, airway, etc. If the etiology is not resolved, then will recur no matter how you treat the symptom. C. Too early to say "permanently" because TAD's have only been around maybe 10-15 yrs. Takes time to get #'s of patients for significance, treatment time, then long-term follow up. When discussing this topic in Current Therapy in Orthodontics , Ravinda Nanda states, "Some treatment alternatives are innovative and promising, but the ability to establish true stability remains unclear. Future studies using these new devices will reveal this truth." Dear Dr. Brandon, after removing a TAD from the place where it was install before, how is the cicatrization process, could be the possibility to be a hole in the area that was placed? Is Ok to use for and open bite? When TADS are removed the area heals back rapidly without any problem or residual effect. Open bites are difficult to treat. TADs may be of some use, but are not a panacea. I will have to check with our orthodontist if they use them much for that. I do know they use them for certain kinds of tooth movements that otherwise would be quite difficult. Hello. Lorena, yes when TAD is removed a hole is left but it'll close within a few days. I already had 2 and I had no problems with them. When you say it doesn't hurt, it's not exactly like that. My first one hurt so badly I couldn't even sleep because if I touched I felt an excruciate pain. After that one i put one more and it hurt less. Then I got those to out and put 3 more and they didn't hurt at all. 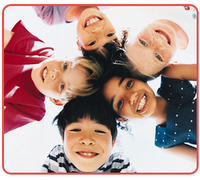 Pediatric dentists are also capable of repairing cavities and tooth decay in children and dealing with oral conditions that are caused by certain medical conditions including diabetes and congenital heart defect. What are the risk if TADs are reccommended and not opted for? Is it purely cosmetic? TADs are nearly another tool for tooth movement. Primarily for anchorage. Tads are usually used when other methods are not possible or are difficult. So, I suppose the risk is you can't move the teeth like you want to. To claify the question about the risk. My son's orthodonist is using them because he says that his distance between his eyes on the left and right hand sides of his mouth is uneven. Is this a different application? Further detail on question regarding risk. The way the orthodontist explained it to me was that they are using the TAD's because my son's L and R sides do not line up even with his L and R eyes. It seemed to be in addition to his braces. Also my dentist doesn't perform this and is sending up to an oral surgeon...so is this done before braces, during or after? TADS can be used for various applications. It is like a fixed post which you can use to anchor something else or to push or pull against. I had this done. The first screw didn't hurt. I just felt pressure. However, by the time my ortho got to the second one, the anesthetic wore off and I felt everything. It was so painful I was crying. So just be sure that the anesthetic is still working before starting to put in the next screw. These devices are no where near anything that should cause a long term problem. I have had my tads in for over a week, my problem is that mine are on the roof of my mouth, and my tongue is scraping up against it causing it to bleed. I put wax on it but it only stays on for a few minutes before it falls off! My teeth are really straight and all adult. I lost half of my 2nd premolar because of a no crown from a root canal (right hand side). Should I get a TAD? I cannot say, but check with your orthodontist. I got my tads for the first time and my mouth is very sore. Eating is a hassle because I can't bite into anything without feeling afraid that they're going to come off. I have to wear these for 6 grueling weeks...ugh. Does it hurt? I'm really worried because i have to wear TAD's and I have dentist phobia .. I just had a TAD inserted today, I cried serious tears. I was upset with the orthodontist telling me there was no pain on pressure, well pressure sure felt like pain. My bottom lip is swollen and he needed to remove it immediately to align it properly. Which was annoying. Afterwards I told him with the advancement of modern dentistry why is this procedure seemingly so antiquated. My bottom lip is swollen and my left jaw. I can't tell if its the wax or my actual cheek. Counting down four weeks!!!! i have had a TAD inserted into the roof of my mouth for a while now, last week in tuesday one of the screws fell out. it was screwed back in, but tonight at about 10pm the other screw fell out. my orthodontist isn’t back until monday, will this affect the device at all or should i be concerned? I would follow up with your orthodontist on that. Most things in orthodontics can wait a few days. You could call their office and get advice for your specific circumstance.